Founder's Packs on sale this weekend. Hi-Rez's turn-based competitive strategy game Smite Tactics enters closed beta today, with guaranteed access—along with the customary pile of incentivising stuff—available as part of a paid Founders Pack. 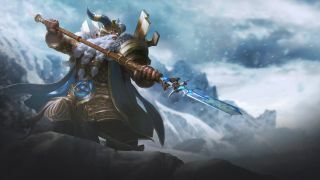 Smite Tactics takes the MOBA's roster of mythological figures and deploys them in an isometric, turn-based strategy game. There's a card collecting and deck-building element that determines the tools at your disposal in each match, with each deck themed around a specific pantheon and led by one of the main gods from that pantheon. In addition to access to the game and a pile of card packs, the $20 Founder's Pack nets you Enyo, the Greek equivalent to the Roman war goddess Bellona. Appropriately, you'll also receive an Enyo skin for Bellona in Smite. Hi-Rez are knocking 25% off the price of the Founder's Pack for the duration of HRX 2017, which runs until Sunday. Check back soon for more on Smite Tactics as it enters this new phase, and until then click here for more on HRX itself.